Today, I taught the second graders about proportion in art. Proportion means the size, the location, or the amount of something in relation to another object. What is natural and expected creates a sort of harmony in the image. The parts compliment each other as they make up the whole. A great example is a human face. Our brains love to find patterns, and one place it does this on a regular basis, is with facial recognition. The placement and size of the eyes, nose, and mouth help us recognize people we know. We search out the pattern and can see it in other places, too. We first explored a face in proportion. It has a lot to do with fractions and symmetry, which the kids are learning about in class. But what does it mean if something is out of proportion? It means something is too big or too small in relation to another object. For example, a nose so big it drags on the ground. Or, it might mean the location is off or not expected, for example, a nose that juts off the forehead. Or, it might mean the amount is different, too much or too little of something. 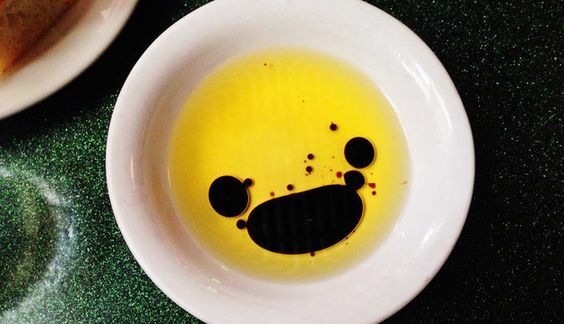 For example, a face with ten noses. The well-known artist, Pablo Picasso, started off painting beautiful portraits. They were realistic looking. 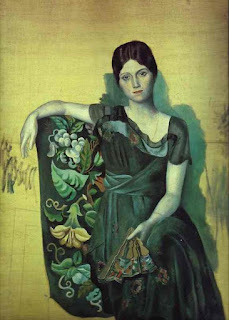 "Portrait of Olga in the Armchair"
But later, he explored other ways of communicating through his art. He is famous for co-founding the Cubist Art Movement, an idea of rejecting a single point of view. 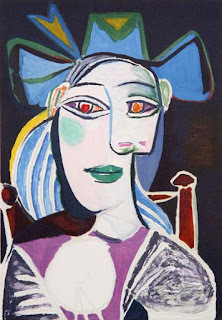 Instead, Picasso chose to show faces from several views, like portrait and profile, at the same time. "Buste De Femme Au Chapeau Bleu"